Below you can easily browse the selection of slopeside ski homes for sale at Deer Valley ski resort in Park City, Utah. Deer Valley is a community located at Deer Valley ski resort in Park City, Utah. Deer Valley is an extremely popular vacation destination and a world renowned ski resort. In fact, Deer Valley Resort has been voted as the #1 ski resort in North America by readers of SKI Magazine for an unprecedented 5 years in a row! With such high praise and accolades, Deer Valley has become a premier and sought after community to own a second home or vacation condo. Many of the homes for sale in Deer Valley offer amazing views, and the best homes also enjoy direct ski-in, ski-out access to the slopes of Deer Valley Resort. When searching for a home to purchase at Deer Valley, there are four main areas of Deer Valley to consider. The Park City Board of Realtors divides the MLS search into four main geographical areas for Deer Valley; Deer Crest, Lower Deer Valley, Upper Deer Valley and Empire Pass. Depending on the type of Deer Valley home you are looking for, you may want to focus your search in one of these four MLS areas. Below we have more information about these sub-communites and you can call us at any time to discuss or ask questions. 435-901-2158. Read about the variety of homes for sale at Deer Valley. Browse Deer Valley homes for sale below or contact Realtors Heather Peterson & Sean Matyja for more information about Park City and Deer Valley real estate. 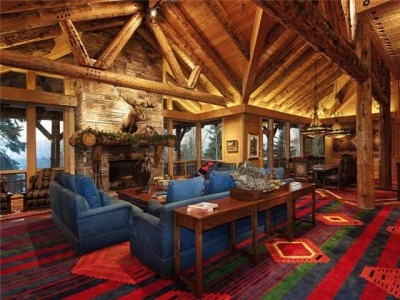 Looking for a Particular Style of home for sale at Deer Valley? When searching for homes for sale in Deer Valley, you will become familar with the four sub-communites of Deer Valley. Empire Pass is a ski-in, ski-out community. Lower Deer Valley is a residential community of homes and condos. Upper Deer Valley has long been the popular and more expensive area of homes and condos in Deer Valley's Silver Lake Village. Empire Pass is the newest area of Deer Valley, offering ski-in, ski-out homes and condos and the famous Montage hotel. Deer Crest is a community of Deer Valley and is quite unique in its offerings of stunning views and easy ski-in, ski-out access. Home for sale in Deer Crest are typically priced from $4 million to $12 million. This is where you will find some of the most amazing luxury mountain homes in the Rocky Mounatin West! Included in the homes available for sale, is the SKI Dream Home, a truly unique, one-of-a-kind home designed to be the ultimate dream home for skiers. Deer Crest is a private gated community and is also home to the new St. Regis Deer Crest hotel at Deer Valley. Condos can be purchased at the St. Regis, and the hotel offers great amenities to the owners of homes in Deer Crest. The Deer Crest Club within the St. Regis is available to owners of Deer Crest homes. If you are looking for the ultimate in views for your dream ski home in Deer Valley, Deer Crest is a place to consider. Click here to view all the homes for sale in Deer Valley's Deer Crest neighborhood. Lower Deer Valley has a wide range of home ownership options. Lower Deer Valley homes are located near the base of Deer Valley Resort's Snow Park Lodge and lower resort parking lots. Many of the homes are located in the foothills extending up from the resort, and these homes often have views looking back to the ski runs of Deer Valley Resort. Lower Deer Valley homes are used in a mix of full-time residents and second homeowners. Many of the homes in this community are in HOA's that do not allow nightly rentals. These homes can range in size from 3,500 - 6,500 square feet typically and range in price from about $1,300,000 to $3,000,000. Click here to view all homes for sale in Lower Deer Valley. Upper Deer Valley ahs long been the pinnacle of home ownership in Deer Valley and Park City. 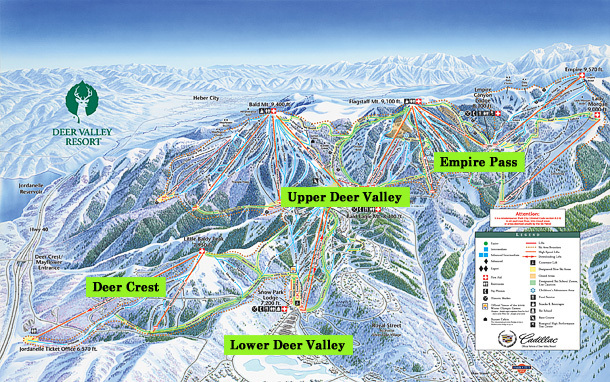 Upper Deer Valley is located from the mid-mountain area of American Flag up to Deer Valley's Silver Lake Village. The homes for sale in Upper Deer Valley are some of the finest you'll find in Park City, but can be older, and some can be a bit dated in style. People are often surprised on how expensive Upper Deer Valley can be knowing that when you buy a home you may need to do some remodeling. American Flag often has homes for sale that offer big views overlooking Park City. This area only has a handful of homes with ski access and they rarely come up for sale. Evergreen is a much sought after area and there normally is not too many homes for sale here either. Evergreen is a ski-in, ski-out neighborhood with homes typically priced from $6,000,000 to $10,000,000. The absolute ultimate neighborhood in Upper Deer Valley would be Bald Eagle. Bald Eagle is a private gated community at the top of Deer Valley ski resort, just above Silver Lake Village. This community offers secluded ski-in, ski-out homes, some with amazing views. There simply is nothing quite like Bald Eagle and it does show in the pricing. Homes for sale in Bald Eagle will typically be priced from $5,000,000 up to $20,000,000. Click here to view all homes for sale in Upper Deer Valley. Empire Pass is the newest area of real estate development at Park City's Deer Valley Resort. This area includes the Village at Empire Pass at the Silver Strike chairlift as well as the communities at the base of the Northside Express chairlift. Empire pass sits at the top of Marsac Avenue at the most western end of Deer Valley Resort. Empire Pass is also the home of the new Montage luxury hotel, and Talisker's Tower Club. If you are interested in Empire Pass, click here to view all homes for sale. Nestled among the slopes of Deer Valley® Resort and Empire Pass you will find Nakoma – an exclusive community of 18 individual mountain homes on 17 acres, offering spectacular, unobstructed views and ski-in/ski-out access. Nakoma gives it’s residents the rare opportunity to own a mountain home at Deer Valley® Resort with private access to the slopes, along with views looking out over thousands of acres of permanently protected forest and mountain terrain. Introducing the “Belle of the Ball” in Empire Pass. From the same developer who brought us BelleAire, BelleArbor, Bellemarc, Bellemont, Belleterre, Bellevue. A new mountain modern community that is located in the heart of Empire Pass at Deer Valley, with a total of 17 Residences. The Tower Club (membership deposit to the Talkisker is often included in the purchase price) is within walking distance of the Belles at Empire Pass. The Belles at Empire Pass offers some of the best values for new construction luxury homes in the Empire Pass area of Deer Valley. Located in Empire Pass, Bannerwood is a small real estate development of custom building lots. These one-half to one acre lots offer easy ski-in / ski-out access off the Banner Ski run at Deer Valley. Only six lots in this neighborhood! At the top of Flagstaff Mountain at Deer Valley®, America’s #1 ski resort, overlooking the community of Empire Pass, are thirty exceptional parcels of land – the custom homesites of the ski-in/ski-out community of Red Cloud. These 1 to 2.5 acre sites will be enhanced by the most distinctive and personal expressions of mountain residences in all of Deer Valley®. Here, thirty discerning families will build luxurious mountain retreats that fulfill all their desires for living well in high country. Need More Info About Ski-in, ski-out Homes at Deer Valley? Local Realtors Heather & Sean can help you with all of your Deer Valley and Park City real estate needs. Call us at 1.435.640.2573 or contact us online for a free consultation.